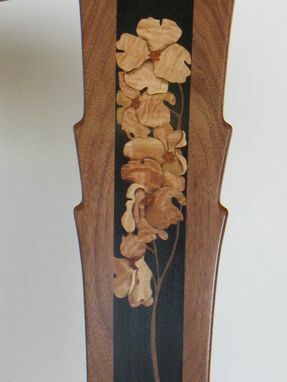 This walnut dining room chair features a marquetry panel of flowering dogwood on the back splat. 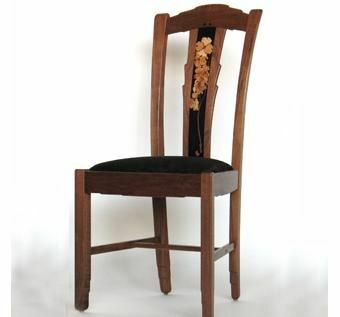 The overall form of the chair is based on the work of designer architects Greene and Greene and furnituremakers Peter and John Hall, all of whom operated in southern California in the early twentieth century. Remarkable aspects include the parallelogram, not square, cross-sections of the front legs and back posts; repeated step design in splat, crest, and legs; and the tactile softening of all edges. I typically make chairs in sets of 6 to 12. Arm chair is also available.